In a recent post I commented on the byproducts of dehydrogenative decarbonylation, namely H2 and CO. 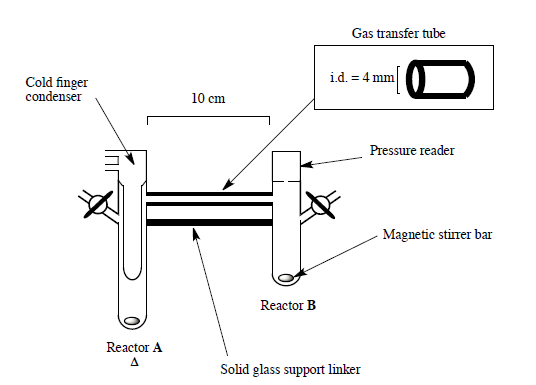 I wondered whether this gas mixture, syngas, could be used in a subsequent reaction. This would improve the atom efficiency of the reaction and potentially also improve the safety (of both the syngas-producing and syngas-using reactions). Both are goals of green chemistry and I especially appreciate avoiding rolling cylinders of toxic and/or flammable gases around the lab. After some digging I found some cool stuff, the most recent being the work from the Andersson group at Upsalla wherein the syngas produced from polyol deoxygenation is used in a subsequent hydroformylation of styrene. In addition, I found Madsen’s excellent paper, which includes lots of interesting references (such as this, where the CO liberated from decarbonylation of cinnamyl alcohol is used in the Pauson-Khand reaction. Note that cinnamyl alcohol can trap the evolved H2! Neat!). In Andersson’s work the syngas-producing step is catalyzed by [Ir(cod)Cl]2 with (S)-BINAP in Reactor A (similar to Madsen’s work). The hydroformylation is simultaneously catalyzed by a different molecule, Rh(H)(CO)(PPh3)3, in Reactor B. Since both reactions are known reactions, the major contribution of this work is a proof-of-principle – ie, that subatmospheric syngas produced in one reaction can be utilized for a subsequent reaction. Moreover, I think the reactor design is straightforward and something any glass shop could handle. And for the big picture, I find the atom efficiency of the dual reaction appealing, especially in the context of conversion of biomass to fuel and commodity chemicals where evolving a portion of your ‘fuel equivalents’ for every molecule of biomass would be wasteful. Since the decarbonylation reaction tends to require > 150 C, I hope to see better catalysts in the future capable of mediating this reaction at lower temperature. With the number of potential H-bonds present on a polyol, perhaps secondary coordination sphere effects would be a possible research direction. By tmckeagberkeleyedu in Synthesis on May 21, 2013 .